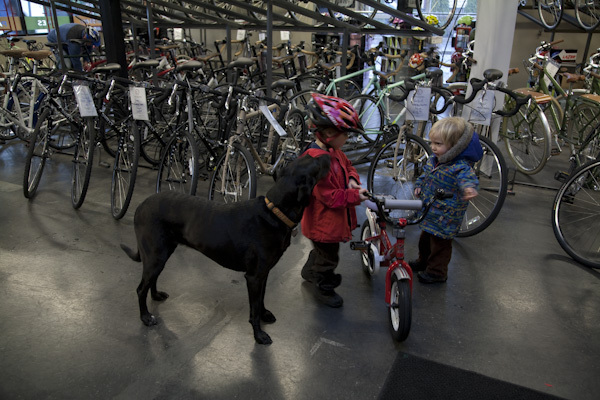 It was cold and nasty today and little-kid cycling weather seemed very far away, but there we were at Seven Corners chatting with Corey, petting the shop dogs and sizing up a tiny, red bike. The weather was so incredibly beautiful this past weekend people were gardening, studying blooms and standing on the street corner visiting with neighbors. On Sunday we joined some friends for a potluck. 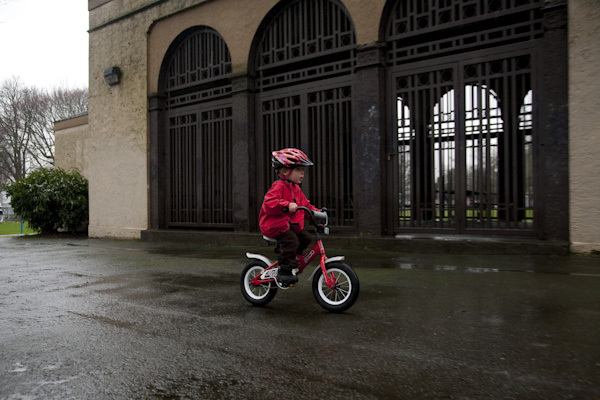 We forgot, however, to bring the boys’ scoots – or pedaless balance bikes – to the party. They scrambled around and shared with the other kids. Jack picked up a bike with pedals and rolled it over to Leo. 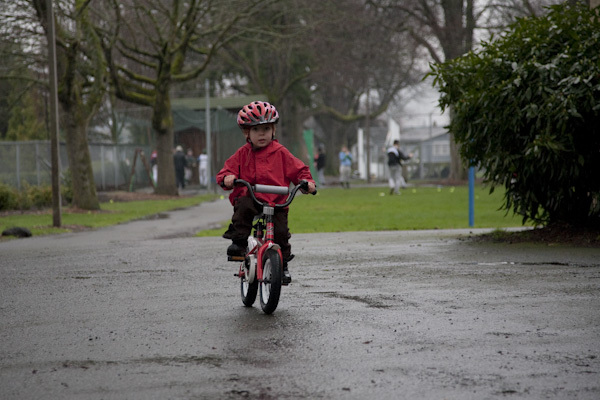 Moments later he was on it, pedaling away and waving off any assistance from Sara. It was his first real bike ride. At first, I stood and watched. But then I ran next to him to make sure everything was going okay. I wanted to help, but he demanded I take my hands off the bike. I didn’t think I was going to really get excited about these things. But as he cruised up and down the sidewalk, I just felt so proud of him for having the confidence to jump on bike and roll. This entry was posted on Tuesday, February 23rd, 2010 at 10:37 pm. It is filed under cycling, family and tagged with cycling, photography, photojournalist, seven corners, tim labarge. You can follow any responses to this entry through the RSS 2.0 feed. Beautiful. so proud! way to go Leo…and Jack the enabler, he will learn earlier after seeing the reward through big brother. That Skuut is a hearty confidence builder, Rory rode as effortlessly the first time as well. after a tag along mtn bike ride this weekend (yeah, the facebook pic), Rory got home and rode his bike for an hour because his older cousins had been doing it on their own. The Skuut is dust and he is going to likely size-up for his 5th bday in June. Gears? Maybe, as crazy as it seems, the older boys were using ’em ….